My name is Lee Wayne Lomayestewa, I work in the Hopi Cultural Preservation Office of the Hopi Tribe as a Research Assistant. 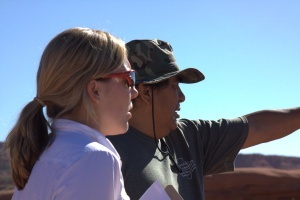 The Hopi Cultural Preservation met previously with the CyArk crew and other agencies including the World Monuments Fund, The Navajo Nation, Arizona Public Service, and the Petrified National Forest. The Hopi Tribe and the Navajo Nation wanted to preserve a petroglyphs site that is very sacred to the Hopi People. The petroglyphs site has been vandalized. The site is “Tutuvehni” which means “Newspaper Rock’. 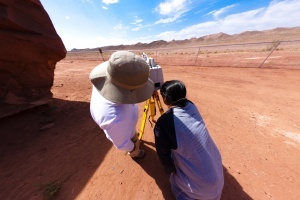 The World Monuments Fund would fund the CyArk Digital Preservation of Tutuvehni, which included CyArk digitally recording the petroglyphs site using laser scanning. The Arizona Public Service co. will erect a chain link fence around the site to protect the petroglyphs. The Petrified National Forest will put up security cameras to record the vandalism. Work started on September 28, 2010 with CyArk beginning the field documentation of the petroglyphs. On the first day, the CyArk crew Kristina Sturm, Scott Lee, and Justin Barton showed me and others how the laser scanning instrument works and how to record. We needed to put in datums in the ground before we started recording and the CyArk crew started to pound in the steel rods in the ground, but the ground was solid rock and the steel rods couldn’t penetrate the rock. Luckily the Hopi fence crew including Ned Lomawaima, Benny Naha and Donnie Mahkewa was there working on the fence and had an air compressor. I asked if they could drill the holes for the rods. They said they could and went to go get the air compressor. They returned to the and drilled all the holes for the steel rods as well as the holes for the security camera and sign. We began recording the petroglyphs. It was cool but I was scared to touch the equipment so I just watched on the first day. On the second day, I start recording using the instrument. The crew from CyArk again told me how to level the instrument, how to pick a target, and record. I finally got the hang of it and didn’t need the CyArk crew. (Just kidding) It was an experience for me to work with the CyArk crew. We finished recording the petroglyphs at Tutuvehni and on the last day we moved to another petroglyph site, Dawa Park. We nearly finished recording the petroglyphs at this site but had to wrap up a bit early in the day. (that’s another story) The CyArk crew left the site and later on that evening we had a nice dinner at the Hopi Cultural Center. I am fortunate to have worked with a good team from CyArk. I think this technology is needed not only here at Hopi but all over the world where other nationalities can have their cultural sites recorded and mapped for future generations. Lee Wayne telling the history of the site to Kristina Sturm. Lee Wayne and Scott Lee doing field documentation at Dawa Park. 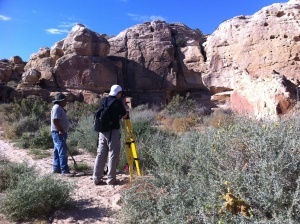 Lee Wayne and Justin Barton laser scanning at Tutuvehni.